Terrorism is the use of violence in which the objective is to harm states, population groups or single individuals in order to cause panic, and reduce their will and power of resistance, so as to advance the political objectives of those employing the terror. Terrorist operations may be divided into two main categories: acts initiated and carried out by terrorist organizations, and acts supported, initiated or carried out by states, which make use of state institutions and organizations for that purpose. Syria under the rule of Assad is a state which affords patronage to terrorism, supports terrorist organizations and uses terrorism as a tool with which to further its strategic objectives. Syria is thus part of that small “club” of seven states sponsoring terrorism, which also includes Iran, Iraq, Sudan, Libya Cuba and North Korea. 1. The purpose of this study is to analyze the use of the “terror weapon” as an instrument of Syrian policy during the 28 years of Syrian President Hafez Assad’s rule. This study was prepared by Dr. Reuven Ehrlich, a Research Fellow at the International Policy Institute for Counter-Terrorism in Herzliya and an expert on Lebanon who has written articles and books on the subject, including a book about Syrian involvement in Lebanon. 2. The study assesses the factors behind the use of the “terror weapon” during the period of Assad’s rule and the changes which have occurred in the 1990s in the choice of targets for terror, as well as in the modus operandi of the activation of the “terror weapon.” It examines the reasons for these changes and the characteristics of Syria’s involvement in terror in recent years. The paper also addresses the question of to what extent Syria’s use of the “terror weapon” has resulted in political gains both in the regional arena and in connection with the Arab-Israeli conflict. The anomalous phenomenon of the use of terror by a state involved in the Middle East peace process and its significance are explored as well. a. The Assad regime has made systematic use of the “terror weapon” since coming to power in 1970. The basic reason for this is the wide gap between Syria’s aspirations to regional hegemony and its desire to play a leading role in the Arab-Israeli conflict, and the objective limitations and weaknesses of Syria from a military, economic and demographic point of view. b. 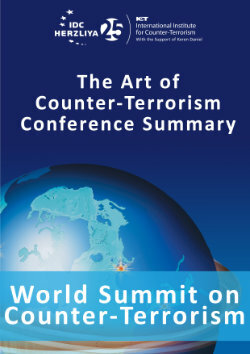 From the Syrian perspective, the intensive use of the “terror weapon” allows Syria to advance a range of its interests both domestically and internationally: it guarantees the stability and survival of the regime at home; it enables Syria to apply pressure to its enemies in the Arab world; it strengthens the “Syrian order” in Lebanon; it punishes Western countries and achieves political gains from them; and, above all else, it furthers Syria’s strategic interests in the conflict with Israel. A recent example of the importance of the “terror weapon” in Syrian eyes is Syria’s strenuous opposition to the implementation of UN Security Council Resolution 425, which is based on its fear of losing the use of the “terror weapon” in southern Lebanon. c. The manner in which the “terror weapon” is used by the Syrian regime, as well as its targets, changes from time to time in accordance with political developments and changing pressures on Syria. In the past decade, one can perceive changes with regard to the manner in which the “terror weapon” was used when compared with the 1970s and 1980s. The factors underlying these changes were: the elimination of domestic opposition, the downfall of the Soviet Union, Syria’s isolation in the Arab arena, Syria’s participation in the peace process and its growing need for the United States. All of these factors led the Syrian regime to try and alter its image as a state sponsor of terrorism via tactical changes in the use of the “terror weapon”, but without making any strategic concessions concerning its use of terrorism as a weapon for advancing Syrian interests. d. In the framework of these changes, it is possible to identify three significant differences between Syria’s use of the “terror weapon” in the 1990s in comparison with the past: first, the Syrians are careful to use “terrorist subcontractors” and refrain from direct involvement in terrorism as a result of lessons learned in the 1980s. Second, the order of priorities of the targets of terror have changed: Israel has become a preferred target whereas Turkey, the Palestinian Authority and pro-Western Arab countries have become secondary targets. Western countries have ceased to be direct targets of terrorism initiated by the Syrians. Third, the Syrians reduced their use of the left-wing Palestinian organizations whose terrorist activities abroad were revealed. They were replaced by a combination of other terror organizations activated by Syria and a joint Syrian-Iranian co-production involving the use of Islamic terror organizations in the framework of the strategic cooperation between the two sides. a. The Syrians provide patronage and political, propaganda and operational support to at least 10 of the 35 terrorist groups (or more than 30%) appearing on the US State Department’s list of state sponsors of terrorism (as of April 1998). The ideology of these terrorist organizations calls for the destruction of Israel and they oppose the peace process, the Oslo Accords, the Palestinian Authority and Yasser Arafat. 4) Other Middle Eastern and International terrorist groups: Kurdistan Workers Party (PKK), Japanese Red Army and other terrorist organizations. c. Hezbollah and other Palestinian terrorist groups’ policy of carrying out terrorist attacks is part of Syrian strategy and is influenced by it. However, Syria does not have sole and absolute control over these terrorist groups. Contrary to the 1970s and 1980s, Syria cooperates with its strategic ally Iran, and the terror attacks carried out by Palestinian Islamic organizations serve the joint and shared interests of the two countries. Thus, the Syrians make use of the Islamic organizations which receive ideological guidance, political and operational instructions as well as military and financial support from Iran. d. The headquarters, training bases, logistical, political and propaganda offices of these organizations are primarily based in Syria. In this framework, it should be noted that Damascus is the primary center of left-wing Palestinian organizations opposed to the Palestinian Authority and the Oslo Accords. Syria serves as an important arena oactivity for Hamas outside of Judea, Samaria and Gaza, and senior Hamas officials carry out operational, political and propaganda activities from Damascus. The infrastructure of the “Palestine Islamic Jihad” outside of Judea, Samaria and Gaza is primarily located in the vicinity of Damascus, from where its operations and activities in the “territories” are directed. e. The leaders of most of these terrorist organizations reside in Syria, from where they oversee and direct the military, political and propaganda activities of their organizations against Israel and other Arab states. Among the senior leaders and activists of the terror groups residing in Damascus are: Dr. Ramadan Shalah, Secretary-General of Islamic Jihad and his deputy Ziad Nehaleh; Imad al-Alami, chairman of Hamas’ “Interior Committee”, who is a dominant figure in activating the organizations’ military apparatus for carrying out attacks; Ahmed Jibril, George Habash and Nayef Hawatmeh, leaders of the three main left-wing Palestinian terrorist organizations. Also active in Syria are middle- and low-ranking military activists of all the abovementioned groups. f. The Syrians permit these groups to maintain their military and political infrastructure in areas under their control in Lebanon. The most widespread infrastructure belongs to Hezbollah, which is also the leading group which concentrates attacks in southern Lebanon. The Syrians also permit some limited activity by the left-wing Palestinian terrorist groups. With Syrian approval, the Beka’a Valley continues to serve as an organizational and training center for Middle East and international terrorist groups. g. The Syrians support a number of anti-Turkish terrorist and underground organizations, particularly the “Kurdish Workers Party” (PKK). They allow the PKK to train in Syria and Lebanon and to use both countries as operational and political-propaganda bases against Turkey. The PKK's leader, Abdallah Ocalan lives in Damascus, and several senior members of the organization also live in Syria. The organization has bases and offices in Damascus, northern Syria, the Beka'a Valley in Lebanon and along the Syrian-Turkish border which are used for operations. h. Islamic terrorist groups operating in Arab countries against pro-Western regimes find sanctuary in Syria and Lebanon and use them as bases for their training activities and logistical infrastructure. The terrorist organizations direct their terrorist and subversive activities against Arab governments from Syria and Lebanon, and the Syrians do not make any serious efforts to prevent it, despite repeated and varied protests by Arab states, including Jordan, Saudi Arabia and Bahrain. 5. An analysis of these organizations' terrorist activities in the service of Syrian and Iranian interests in the 1990s shows that the “terror weapon” has caused damage to Israel and the peace process of both a strategic and tactical nature. The use of the “terror weapon” in the era of the peace process has caused casualties in Israel, both among the IDF and the civilian population. Besides this, these organizations' attacks, particularly by the Palestinian Islamic groups, significantly contributed to the disruptions in the peace process, mainly in the Israeli-Palestinian sphere. 6. There is an anomaly before us in that Syria is the only member of the “club” of nations supporting terrorism which also participates in the peace process. Syria's participation in the peace process is, in its view, a source of strength, since it gives Syria a form of “immunity” from military retaliation for its anti-Israel terrorist activity. But at the same time it is a source of weakness, since Syria is more vulnerable and exposed than in the past to political pressures from other countries participating in the peace process. Past experience proved that the use of political pressure on Syria, mainly by the United States, brought about restraint and moderation in the use of the “terror weapon”, although it did not put an end to the Syrian use of it. 7. The main lesson from analyzing the phenomenon of Syria's use of terrorism as an instrument to obtain political gains in the era of the peace process is that alongside the existence of the process, a determined continuous struggle must also be waged against terrorism and against the countries behind it. The bitter lesson learned over the past several years is that if the use of terrorism is not halted, it will be very difficult, and maybe impossible, to make progress in the peace process at all levels. In this connection, it would be worthwhile to emphasize that Israel's struggle against terrorism is not enough in itself, but requires close and continuous political and security cooperation by all countries interested in the success of the peace process, and the United States must take the leading role in this effort. Such cooperation must find expression, among other things, in systematic pressure on Syria and on other countries who consider the frequent and systematic use of the “terror weapon” as a legitimate tool to promote their internal and external interests. Beyond the ongoing and continuous struggle against terrorism and countries giving it sanctuary, there exists a fundamental shared interest of Israel, the United States, the European Union and pro-Western Arab states, in which any future peace treaty between Israel and Syria must include a clear Syrian obligation, supported by international supervision and surveillance mechanisms, to reject the use of the “terror weapon”. Insistence by Israel and pro-peace countries on this issue is both prudent and justified in light of the destructive potential inherent in the “terror weapon”, which, if not uprooted and neutralized could intensify in the future and once again be directed not only against Israel and its neighbors, but also against the entire international community. Hafez el-Assad and Muammar Ghadafi: members in good standing of the "sponsors of terror club"
The use of terror as an instrument in the hands of Syrian policymakers, as well as the sponsorship of terrorism, is as old as the Assad regime. The use of terror, and the way in which it has been utilized by the Syrian regime, has changed over the years, as a consequence of developments in Syria, in the inter-Arab arena, in the Arab-Israeli conflict, and in the relations between Syria and Western countries, principally the United States. In the course of the 1970's and '80's the Syrian regime faced internal and external difficulties, which led it to an intensify its use of terrorism, at times including direct Syrian involvement in acts of terror. In the '90's, witthe stabilization of Assad's domestic situation, the establishment of the “Syrian order” in Lebanon, the reduction of tensions between Syria and other Arab states, Syrian involvement in the peace process and the loss of its main supporter after the collapse of the Soviet Union -- the Syrian regime was forced to change the manner in which it exploited terrorism. It did not abandon the use of terror as a way of advancing its strategic objectives, but had to alter its mode of operation in order to blur its involvement. What is the significance of Syrian support for terrorist organizations? Syria's patronage first and foremost allows the terrorist organizations to find refuge and shelter on Syrian or Syrian-controlled Lebanese territory, where they enjoy comfortable political and security conditions. Terrorist groups can thus organize training; develop a logistical infrastructure (Weapons, storehouses, communications, documentation, funds and so on); they can take advantage of the political and propaganda cover of official Syrian bodies. They can travel freely between Syria, Lebanon and Iran, and between Syria and Lebanon and other Arab states; they can develop channels of communication to the existing infrastructure in Judea, Samaria and Gaza; they can travel to and from Europe; they can develop a financial infrastructure and pass money on to activists in Judea, Samaria and Gaza; they can benefit from each others' assistance; they can establish contacts with other terror-supporting states, principally Iran, Syria’s ally. At he same time, the Syrians keep a close eye on the terrorist organizations, particularly those who might potentially pose a danger to the regime. The Syrians see these organizations as essentially bargaining chips, which may be cynically used and then discarded. They expel terrorists from their territory and that of Lebanon, or imprison them without charge; they send intelligence agents into the organizations, and use them according to the shifting needs of the Syrian intelligence structures. Why does the Assad regime choose to use terrorism as a preferred instrument of policy? The central reason for Syria's support for terrorism is the wide gap between the far-reaching ambitions of the Syrian regime to achieve regional hegemony - primarily via Lebanon, Jordan and the Palestinians - and to play a leading role in the Arab-Israeli conflict, and the objective limitations and weakness of the Syrian state. In the military field, Syria has a strong military but is clearly inferior to Israel; It is not a state with a large population and political tradition of longevity, as is Egypt. It does not possess great natural wealth and economic resources, as do Saudi Arabia, Kuwait or Iraq; It has no tradition of democracy or openness, and the existing Alawi regime, though it has brought Syria stability, behaves in a brutally oppressive fashion toward the opposition, which draws its own strength from the Sunni Muslim majority. In the absence of military, economic or demographic capabilities to translate into political strength and no moral or legal impediments, and without legitimacy at home, the regime has turned terrorism into its main weapon. The intensive and continuing use of terrorism makes it possible for the Syrian regime to advance by force a wide range of objectives while fitting in with changing requirements and developments: ensuring the survival of the regime at home; “punishing” Western countries and obtaining political gains from them; punishing Syria's enemies in the Arab world and applying pressure to them; and advancing Syria's interests in the Arab-Israel conflict. All this is accomplished without the need to resort to military force or engage in a military confrontation with Israel at an inopportune moment and in potentially disastrous circumstances. Following is an analysis of the use of the “terror weapon” by the Syrians since 1970. This analysis will seek to compare the use of the “terror weapon” in the 1970s and 1980s versus the changes that have occurred in the Syrian modus operandi in the 1990s. It will also provide an updated assessment of the Syrian regime’s support and patronage for terrorist organizations. In the 1970's and '80's the Assad regime made extensive use of military force and brutal oppression to suppress domestic Sunni Muslim opposition, which at that time had raised its head and posed a danger to the stability of the regime. The use of the state’s military force to suppress opposition is not typical only of the Assad regime. Such methods have also been used by other members of the “club” of nations which support terrorism such as Saddam Hussein of Iraq, who did not hesitate to use chemical weapons against his own people, and the Iranian regime, which assassinated its opponents abroad. The clearest expression of the use of the state’s military force against domestic opposition was the suppression of the popular rising in the city of Hama by elite units of the Syrian army, led by the 569 division, commanded by Rifa'at Assad, younger brother of the President, and the commando units (“special forces”) headed by Ali Haydar, (a prominent Alawi officer loyal to Assad). In the course of the attack carried out by these units on the city of Hama, the fourth largest city in Syria and stronghold of the Muslim Brotherhood, in January 1982, 15-20,000 Syrian civilians were killed, and whole neighborhoods were completely destroyed in this ancient and well-known city. The use of terrorist methods against opponents of the Assad regime has taken place not only within Syria itself. Opposition members living in Europe and the Middle East have been systematically murdered by the security and intelligence agencies of the regime, who have made use of diplomatic immunity and of Syrian embassies as bases for carrying out terrorist operations. Some examples of assassinations of this kind in which Syrian governmental institutions were involved: In Amman a member of the Syrian embassy’s personnel stood at the head of a death squad which murdered Abed al-Wahab Bakri, exiled leader of the Muslim Brotherhood. (July 1980). In Kuwait Syrian embassy employees were behind an attempted terrorist attack on an organisation of Muslim Brotherhood supporters (November 1980). In Paris, Salah al-Din al-Bitar, a former prime minister of Syria and one of the founders of the Ba'ath party, was assassinated (July 1980). In West Germany the Syrian embassy was involved in an attempt on the life of Muslim Brotherhood leader Issam al-Attar, in which Attar's wife was killed (March 1981). In the pan-Arab arena, frequent use of the “terror weapon” has been made by Syria against Lebanon, Jordan and the Palestinians, three of the component factors of “Greater Syria” (in the Syrian view). This was done in an attempt to impose Syrian hegemony over them and bring them into line with Syrian policy. Syria also used the “terror weapon” against Egypt and Iraq, its two main rivals in the Arab world, albeit with less successful results. It was used against Egypt at the end of the 1970s because of what the Syrians viewed as Egypt’s departure from its joint strategy with Syria (by agreeing to make a separate peace with Israel after Sadat’s visit to Jerusalem). Iraq, on the other hand, served as a target for terror attacks so long as relations between the competing Baathist regimes were hostile. What particularly stands out in the pan-Arab arena is the Syrian use of terrorism in Lebanon, mainly against opponents of the “Syrian order”. The main Lebanese leaders killed by Syrian proxies were: Bashir Gemayel (who was accused by Syrian propaganda of being a “Zionist proxy”); and Kamal Jumblatt (accused of being a “traitor” and an “American agent”). Bashir Gemayel, commander of the “Lebanese Forces”, was murdered by Habib Tanius Shartouni, a member of the Syrian Social Nationalist Party (SSNP), (which has often been used as a “subcontractor” by Syrian ), three weeks after being elected president of Lebanon (September 14, 1982). Kamal Jumblatt, the main Druze leader who stood at the head of the Palestinian and left-wing organizations and was the moving spirit behind the anti-Syrian coalition in the Lebanese civil war, was murdered by Syrian agents after the Syrian army took over the Shouf mountains and entered Beirut (March 16, 1977). The Lebanese media also came in for special treatment, having shown too much support for Syria’s opponents, in the opinion of the Syrians, during the Lebanese civil war. For example Salim al-Lawzi, editor of the newspaper Al-Hawadeth, who took an anti-Syrian line in his paper and was forced to flee to London, was brutally murdered during a visit to his homeland. (His body was found on March 4, 1980. His fingers had been dissolved in acid, as a warning to all who might dare to write against Syria). forced to leave by the Israeli army in 1982), the Syrians killed 23 men and women in the Basta quarter in the northern part of the city. The Syrians claimed the victims belonged to Hezbollah and opposed the handover of their base to Syria. Hezbollah labeled it a “massacre in cold blood.” “Voice of Islam” radio, the Hezbollah station, claimed that the pathology report of the doctor who examined the bodies confirmed that all those killed had received gunshots to the head, from behind, from a distance of three meters. Among the dead were 4 women, and 4 youths. All had been shot in a single room. It became clear that all had been subjected to violence and torture before being killed. Their hands had been tied behind their backs (“Voice of Islam”, February 25, 1987). Approximately 50,000 people took part in the victims funerals, chanting “Death to Ghazi Cana’an”, as he was viewed as bearing responsibility for the massacre (Al-Nahar, February 26, 1987). Not only in Lebanon have the Syrians made use of terror. Jordan was a preferred target for Syrian terrorism in the first half of the 1980's, against the background of the deterioration in relations between the two countries. Egypt became a target after Sadat's visit to Jerusalem and the Camp David Accords as part of a campaign to punish Egypt and isolate it in the Arab world. The PLO and Fatah leadership were also a traditional target for Syrian terror whenever relations became strained, against the background of the ongoing Syrian desire and efforts to become the sponsor and guardian of the “Palestinian cause”. In the 1970's and '80's the Syrians carried out a large number of terrorist attacks or attempted terrorist attacks against several Arab states, either through direct involvement or by employing Palestinian "subcontractor" organizations. Prominent among these groups was the Saiqa organization (a Palestinian group completely under Syrian control), which operated under the name of the "Revolutionary Eagles". Attacks were also carried out by the Abu Nidal organization led by Sabri al-Banna (Abu Nidal), which in the 1980s acted as a subcontractor for the Syrians. In 1983-85, after moving his infrastructure from Iraq to Syria, Abu Nidal directed his organization’s terrorist activities against Jordanian diplomats in Jordan and abroad. The attacks ceased in 1985, with the rapprochement between Syria and Jordan. An additional wave of attacks against Arab targets began at the end of the 1970s, after Anwar Sadat’s visit to Jerusalem and the beginning of the Israeli-Egyptian peace process. The most prominent terrorist attacks against Arab targets after Sadat’s visit were: The attempt to blow up the Egyptian embassy in Bonn (January 1978); the taking over by Saiqa of the Egyptian embassy in Ankara (July 1979); the unsuccessful attempt on the life of Jordanian Prime Minister Muder Badran (January 1981) the abduction of the Jordanian representative in Beirut, Hisham Muhsan (February 1981); two attempts on the life of Arafat (October 1981); the explosion of a car bomb outside the offices of the pro-Iraqi Lebanese newspaper “Al-Watan al-Arabi” in Paris (April 1982 (in the explosion, a woman was killed and more than 60 passers-by were wounded. Later, two Syrian intelligence officers were expelled by the French from the Syrian embassy in Paris); the killing of Issam Sartawi, a PLO official who initiated dialogue with Israel, was carried out in Portugal by a gunman belonging to the Abu-Nidal group, apparently on behalf of the Syrians. (April 1982). (The statement taking responsibility for the killing of Sartawi was published in Damascus, and the hit squad set out on its mission from Damascus). Yasser Arafat and the PLO leadership openly accused Syria of being behind the killing of PLO official and former Mayor of Hebron, Fahd Kawasme, in Jordan (December 1984). a) Syria understood the importance of winning the support of the US -- the only superpower left after the collapse of the USSR, Syria’s primary sponsor. The importance of the US grew with its involvement in the peace process and its role as a sponsor of the 1991 Madrid Conference. To this end, Syria had to try and reduce the damage which it accrued as a result of the use of terrorism in the 1970s and '80s. Since 1979, Syria has been included in the American list of states which sponsor terror; this gave it a very negative image among American public opinion and in the U.S. Congress, obstructed its relations with the US and prevented it -- inter alia -- from receiving economic aid or assistance with sensitive American technologies. Similarly, use of the terrorism weapon obstructed Syria's relations with the European Union, which placed an embargo on Syria following the revelation of the "Hindawi affair," which was partly dropped in November 1994.
b) Syria developed an outstanding interest in winning the support of pro-Western Arab countries, including countries such as Egypt and Jordan, which are also involved in the peace process. During the 1970s and '80s, it will be recalled that such countries were prominent targets for use of the Syrian terrorism weapon, against the background of political differences of opinion between them and Syria. c) At the same time Syria was not neglecting its basic outlook which views the use of terrorism as an important means of advancing its political interests, among them regaining the Golan Heights, and strengthening its position. It was Syria's involvement in the peace process and the difficulties which it encountered on the Israeli-Syrian negotiating track, which strengthened the Syrians' interest in using indirect pressure on Israel via terrorism. This factor, in Syria’s view, required her not to abandon the terror weapon whereas the two previous considerations cited above compelled Syria to change the manner in which this weapon was used. These considerations -- along with the stabilization of Syria's internal situation and the deepening of the "Syrian order" in Lebanon -- moved the Syrian regime to decide on changes in both the choice of targets for the "terrorism weapon" and regarding the way in which it was used. During the 1990s, Israel became the main target for Syrian backed terrorism, with Syria's opponents in the Arab countries, the Palestinian Authority and Turkey serving as secondary targets. However, the use of the terrorism weapon was -- as a general rule -- halted against the US and other western targets, and the overt use of the terrorism weapon against the Syrian regime's domestic opponents was moderated. (Note: In several cases, such as the attack in Daharan, Saudi Arabia, which caused the deaths of 19 American soldiers, the “fingerprint” of terrorist organizations operating under Syrian patronage, was detected. In this context, the Jordanian newspaper Al-Hayat (25.1.97) reported that a CIA report had charged Assad with responsibility for the terrorist act in Daharan. It was stated in the report that the explosive material which was used in the attack was put together and prepared in the Lebanese Beka'a Valley and was sent from there to Saudi Arabia, via Syria and Jordan. According to the report, the CIA has reliable information, according to which Syrian intelligence executed the Saudi national who was enlisted for the action, since he knew about the Syrian involvement). In the 1990's, there were prominent changes even in the Syrian modus operandi in using terrorism. Political and economic constraints dictated the need to be careful in using terrorism and in making it harder to detect “Syrian fingerprints”. The weakening of the pro-Syrian Palestinian terrorist organizations and the strengthening of the Islamic fundamentalist organizations in Lebanon and among Palestinian society dictated -- to the Syrian regime -- the need to choose, during the 1990's, new "terrorist subcontractors." They were chosen from among the Shi'ite and Sunni, Palestinian and Lebanese Islamic organizations, which are linked to Iran, Syria's strategic ally in the region. These organizations' links to Iran enabled the Syrians to feign a lack of knowledge about their operational involvement in terrorism. At the same time, the importance of the leftist Palestinian organizations -- which had served as the main "terrorist subcontractors" in the 1970s and '80s -- declined; the Syrians made an effort to stop being identified with their terrorist actions abroad. Against this background, Abu Nidal and his agents were expelled from Syria to Libya (1987); the terrorist activity of the Palestinian leftist organizations shifted from overseas to Lebanon, Israel and the West Bank and Gaza; and the pro-Syrian Palestinian Saiqa group, which served as an important instrument of Syrian terrorism policy in the 1970s and '80s, declined and practically disbanded. As part of this policy, figures involved in international terror on behalf of Syria were deported, such as Ilich Ramirez Sanchez, known as “Carlos the Jackal” (who was recently sentenced to life in prison by a French court). The increasing cooperation with the Islamic, Iran-linked “terrorist subcontractors” presented the Syrians with new operational options, such as using religiously fervent volunteers for suicide operations. At the same time, the Syrians were faced with new kinds of dilemmas and constraints, which did not exist in their relations with the Palestinian leftist organizations during the 1970s and '80s. Following is an assessment of Syria’s terror policy in the 1990s and their modes of operation. “Terrorist organizations” will be defined below as those organizations which the US defines as international terrorist organizations (as of April 30, 1998). Of the 35 organizations which appear on the US State Department list, the Syrians provide patronage, and maintain political, propaganda and operational cooperation with at least ten of them (or more than 30% of those appearing on the list). 4) Kurdistan Workers Party (PKK), Japanese Red Army and other terrorist organizations. The Hezbollah organization -- whose terrorist actions against American and French targets during the war in Lebanon served Syrian policy well -- has become, during the 1990s, the most important terrorist instrument serving Syrian objectives. The Syrian regime uses the organization in order to advance its political interests in the peace process, and Hezbollah’s operations are well-integrated into Syria’s strategy. This, despite the fact that the Hezbollah organization is deeply tied to Iran (from which it receives ideological inspiration, operational, political, military and financial aid), despite Hezbollah having its own interests which do not always coincide with those of Syria, and despite the great ideological distance between Hezbollah and the Syrian Ba'athist regime. Hezbollah's military activity against Israel fits in well with Iran's views on "exporting the revolution", and -- at the same time -- is seen by the Syrians as an effective tool for placing continuous pressure on Israel via the shedding of IDF blood in Lebanon. The goal of this pressure – in the view of the Syrians -- is not just to “liberate” the Security Zone from its IDF presence, but -- first and foremost -- to get Israel to agree to Syria's demands vis-a-vis the Golan Heights in the framework of the peace process. It is for this reason that the Syrians strenuously oppose the Israeli Cabinet’s April 1, 1998 decision regarding the implementation of UN Security Council Resolution 425. The resolution requires the elimination of Hezbollah’s military capabilities and an end to its terrorist activities from Lebanon which, in the Syrian view, would deny them an important bargaining chip vis-a-vis Israel. Additionally, support for Hezbollah also helps Syria to preserve its strategic relationship with Iran, an important asset in Syrian foreign policy, and helps the Syrian regime to deal with the opposition at home. An analysis of Syria's assistance to Hezbollah indicates that the most important service that the Syrians have made and are making is their readiness to allow it to exist as an organization with a military infrastructure within the framework of the “Syrian order" in Lebanon - in complete contrast with the dismantling of the other Lebanese militias. In order to facilitate Hezbollah's ongoing military activity in Lebanon, the Syrians have refrained from disarming it in the wake of the “Taif Agreement” (1989) and have left it as the only organization which maintains an established military infrastructure. Furthermore, at the end of the 1980s, when there was a sharp military and political conflict between Hezbollah and the Amal movement (the more pragmatic of the Shiite groups), the Syrians helped Hezbollah to emerge from the confrontation as the victors. After a short period in which Amal succeeded in removing Hezbollah military infrastructure from southern Lebanon (1988) and bringing about a sharp drop in Hezbollah's military activity against Israel, the Syrians and Iran mediated the "Second Damascus Agreement". This agreement enabled Hezbollah to re-establish its military infrastructure in southern Lebanon (1991) and marked its becoming the leading organization in operational military activity against Israel from Lebanon in the 1990s. Lebanese Prime Minister Rafik Hariri's attempt -- following “Operation Accountability” (1993) -- to send Lebanese army forces to the area south of the Litani River in order to restore control of the area to the Lebanese administration, was torpedoed by the Syrians. The Syrian regime saw, and continues to see, Hezbollah as an important tool in advancing their policy, and therefore oppose any weakening or dismantling of its operational capability. a) Syria encourages Hezbollah to maintain ongoing and continuous warfare against the IDF and SLA in the Security Zone and the Jezzine enclave. The main expressions of this warfare are: mortar, anti-tank and small arms fire at IDF and SLA positions or at IDF and SLA forces in the Security Zone or the laying of explosive charges. “Quality” operations to take over SLA outposts or infiltrate car bombs into the Security Zone are carried out less frequently. b) Syria is not directly involved in Hezbollah's daily, ongoing activity, but suffices with determining its general line. In our analysis, Syria lays down general guidelines in accordance with its interests regarding the “heating up” -- or relaxation -- of the situation in southern Lebanon, and takes care that there are no prominent exceptions in Hezbollah activities which could harm its interests. In contrast to the Syrians' deep involvement in the terrorist actions which were carried out in the 1970s and '80s by the Palestinian groups, their involvement in Hezbollah’s ongoing activity has been indirect and vague, and therefore also more difficult to prove. It seems that the Syrians are not actively involved in choosing the organization's tactical targets, and in defining the nature and timing of most Hezbollah attacks as long as these jibe with Syrian policy and do not cause the Syrians political damage or are liable to lead to a military deterioration and under circumstances not to Syria's liking. c) Syria encourages Hezbollah to refrain from actions which may harm Syrian interests vis-a-vis the conflict with Israel or its relations with the US, or which may cause an uncontrollable deterioration. Thus, for example, the Syrians encourage Hezbollah to refrain from firing Katyusha rockets at Israel as part of its ongoing confrontation with the IDF in southern Lebanon within the framework of the “Grapes of Wrath” understandings as well as their basic interest in preventing a deterioration of the situation. At the same time, the Syrians do not prevent Hezbollah from placing their military infrastructure within Lebanese villages and launching attacks from within the villages, something which violates the “Grapes of Wrath” understandings. d) Syria has ensured that Hezbollah moderates, or even halts, its terror activities in southern Lebanon for short periods of time when Syrian interests so demand: This has been the case with respect to the peace process, its relations with the United States (such as when senior American officials visit Syria or the region, or during the course of important political contacts with Israel), and internal Lebanese events impacting on the "Syrian order" in Lebanon (such as the elections for the Lebanese parliament on 18 August 1996, prior to which there was a noticeable drop in the number and "quality" of Hezbollah attacks), or during periods such as the Gulf War, when Syria had an interest in keeping things quiet in southern Lebanon. To what extent has there been an erosion in Syrian encouragement of Hezbollah in the framework of the “rules of the game” to focus on attacks in southern Lebanon? Until recently, it appeared that the Syrians did not encourage Hezbollah to operate outside of Lebanon. However, attempted infiltrations from Syria to Lebanon by Hezbollah terrorists in the first few months of 1998 may indicate changes in Syrian policy. Our assessment is that in those exceptional cases in the past where Hezbollah did operate outside of Lebanon, its actions were coordinated with Iran and not with Syria. This, with regard to terror attacks carried out by Hezbollah in 1992-94 against the Israeli embassy and the Jewish community center in Buenos Aires, and two other attempted attacks which were thwarted in Israel: the first, in April 1996, by Hussein Makdad, a Shi’ite Hezbollah member, and the second in November 1997 by Stephen Josef Smirek, a German citizen who had converted to Islam. a) The Jordanian weekly “Al-Bilad” (February 16, 1998) and the daily “Al-Hadath” (March 9, 1998) reported that in February 1998, after the beginning of the crisis between the United States and Iraq, the Jordanian security services arrested a band of five Hezbollah infiltrators. The group had arrived from Syria, crossed the border near Ramtha, and planned to travel to Amman in order to carry out terror attacks against American and Israeli targets in Jordan and possibly even in Israel. According to “Al-Bilad”, it was Syria and Iran which were behind the infiltration. b) The Jordanian weekly “Al-Shihan” (April 18, 1998) reported that Iran sees Jordan as a primary target for “exporting the revolution” and that Iran is encouraging Hezbollah and Palestinian groups opposed to Arafat (such as Jibril’s organization) to carry out terror attacks against Israeli targets in Jordan. As a result, claims the newspaper, the Jordanian security forces detained terrorists identified with Hezbollah during the month of April who had planned to attack a bus of Israeli tourists. They also reportedly captured a group of terrorists from one of the Palestinian opposition organizations, which had planned to attack Israeli tourists at Petra during the Passover holiday. One can assume that these “rules of the game” are synchronized with Syrian interests, and with current political circumstances in the region. A unilateral IDF withdrawal from Lebanon would most likely cause the Syrians to allow and even encourage Hezbollah and Palestinian terrorist organizations carry out terrorist strikes both inside Israel and abroad -- as did the Palestinian organizations in the 1970's and '80s, when Syria had not yet achieved its goals through the peace process. Based on past experience, it can also be assumed that a deterioration or even substantive differences of opinion between Syria and the West (or pro-Western Arab regimes) could bring the Syrians to again resort to terrorism from Hezbollah or other terrorist factions. A) Permission for Hezbollah to locate its military-political infrastructure in the Syrian-controlled areas of Beirut and the Lebanese Beka'a Valley. Hezbollah's headquarters, training bases, arsenals, broadcast stations and other infrastructure facilities are located in areas under uncontested Syrian control -- in the central Beka'a Valley (Ba'albek, Nabi Sheet, Janta, Brital) and in the Shi'ite quarters of southern Beirut. In these areas, where the authority of the Lebanese government is weak, the Syrians allow Hezbollah to maintain partially autonomous areas under its control and to fulfill various governmental functions thanks to large cash infusions which Hezbollah receives from Iran. The proximity of this infrastructure to Syrian army bases, mainly in the Beka'a, offers Hezbollah a Syrian “aerial umbrella” and provides the organization with Syrian security assistance. Weapons arriving from Iran are unloaded at the airport in Damascus and shipped to Hezbollah bases in the Beka'a Valley and Beirut. The London-based Al-Hayat newspaper (02.02.97) reported that Iranian air transports do not undergo any form of inspection in Damascus and are delivered to the Revolutionary Guards in Ba'albek. Moreover, in some instances, Iranian aircraft returned with coffins -- which the Syrians suspect were used to smuggle illegal equipment or Lebanese and foreign hostages from Lebanon to Iran; Syria, however, did not intervene, for fear of impairing its relations with Tehran. These transfers from Teheran to Damascus also enable Syria to supervise the flow of weapons to Hezbollah, giving the Syrians effective leverage over both Hezbollah and Iran. Syria thus serves as a lifeline for Hezbollah. D) Syria allows the unfettered passage of Hezbollah fighters and arms reinforcements from the Beka'a Valley and Beirut to the frontline in southern Lebanon. Members of Hezbollah who travel from their bases to the front in southern Lebanon are furnished with travel permits signed by senior Syrian officials. Syrian and Lebanese military checkpoints allow Hezbollah members with these permits to move freely between their rear-guard bases and the front lines. E) Existing cooperation between Hezbollah and the intelligence branches of Syria and Lebanon. This cooperation benefits all parties concerned, while directly impacting on Hezbollah military actions against the IDF and the SLA in southern Lebanon. Some of the information gathered by Syrian and Lebanese intelligence on the IDF and the SLA in the Security Zone and Jezzine area is transferred to Hezbollah and then exploited for operational needs. Over time, established forums -- such as the Quadripartite Committee (to which Amal is also a partner), which periodically convenes in Ramaile, south of Beirut -- have been created for consultation and intelligence exchanges. F) Syria encourages operational cooperation between Hezbollah and left-wing, pro-Syrian Palestinian organizations. Hezbollah allows these left-wing groups to deploy in territory under its control, from which they carry out attacks, sometimes in conjunction with Hezbollah. This holds particularly true for Ahmed Jibril's PFLP-GC, a group with a rich history as “terror subcontractors” in the service of Syria. G) Syria acts in the informational and political spheres to legitimize Hezbollah activity in the Lebanese, inter-Arab and international arenas. This effort aims to present Hezbollah (and the other organizations acting against Israel from Lebanon) as a legitimate "national liberation movement" and as "resisting the occupation." The Syrian-sponsored Lebanese administration also offers political and informational backing for Hezbollah – for example, cooperating with Hezbollah in the discussions of the committee monitoring the “Grapes of Wrath” understandings, sometimes even representing its positions and interests. This legitimacy is particularly vital for Hezbollah, being defined by the United States as a "terrorist organization" in the service of Iran, and having been implicated in past kidnappings of Westerners and terrorist attacks against American and Western targets in Lebanon. Syria currently serves as a center for eight Palestinian terror organizations which reject the peace process and the peace accords and oppose Arafat. Five of these Palestinian terror organizations are among the most radically leftwing: the “Popular Front for the Liberation of Palestine - General Command (PFLP-GC)”/Ahmed Jibril, the “Democratic Front for the Liberation of Palestine (DFLP)”/Na'if Hawatmeh, the “Popular Front for the Liberation of Palestine (PFLP)”/George Habash, “Fatah”/Abu Mussa, and the radical segment of the “National Struggle Front”/Khaled Abd al-Majid faction. Three of the eight organizations belong to the pro-Iranian Islamic stream:- “Islamic Jihad in Palestine”/Shkaki faction, “Hamas” and “Hezbollah in Palestine”/Ahmed Mah'anah faction. Damascus and its vicinity provide a haven for most of the leadership and the political and military infrastructure of these eight terror organizations, as well as for other Palestinian terrorist groups. Furthermore, these organizations have established - with Syrian approval of course - representations and operational infrastructures in the Syrian controlled aof Lebanon. These organizations are considered by Damascus to be an important opposition against Arafat and the Palestinian Authority and they also serve as a means of exerting pressure on Israel. The manner in which Syria exploits these organizations - from the political and operational standpoint - is a product of changing Syrian interests, at the center of which is Syria's standing in the peace process and its relationship with Arafat and the Palestinian Authority. Unlike during the 1970s and 1980s, Syria encourages those Palestinian terror organizations under its auspices to concentrate their activities in Israel and Judea, Samaria and Gaza, or against the IDF presence in Lebanon and possibly also Israeli targets in Jordan, and generally does not encourage terror activities outside of the Middle East. The Syrian regime views these activities as an effective means to increase internal tension in Israel, and to exert pressure on the Israeli government and the Palestinian Authority. From the Syrian viewpoint, all these are intended to advance the political efforts on the Israeli-Syrian track, and at the same time place obstacles on the Israeli-Palestinian track. Syria aids and shelters Palestinian terrorist organizations with a fundamentalist Islamic character whose religious ideology (of Iranian origin) opposes the peace process and openly calls for the destruction of Israel. These organizations have operational infrastructures in Judea, Samaria and Gaza via which they carry out terrorist acts in Israel. Their objectives are clear: to stop or at least disrupt the peace process, with an emphasis on the Israeli-Palestinian track; to remove the Israeli presence from the territories, and particularly the settlements, by generating pressure on Israel through terror attacks against civilians; to subvert the Palestinian Authority, which in their view is a secular authority that cooperates with Israel, while avoiding a direct confrontation with it. For the Islamic organizations, Syria serves as a convenient and essential location outside of the territories from which to organize and conduct political and propaganda activities and direct the actions of their operational infrastructure in the territories. These organizations prefer Syria over other locations in Arab countries or outside the region for the following reasons: in Syria they enjoy political immunity and security protection, and sometimes logistical support, of the Syrian regime; geographically, Syria is close to Israel and the territories, and enjoys easy access to Lebanon and Jordan. In Syria it is easy to receive the assistance of left-wing Palestinian organizations, and Syria serves as an opportune place to maintain contacts and conduct meetings with Iranian officials.